This was a pretty nice week. Not too many appointments so it felt like I had a breather and time to work a bit on some publishing tasks. Only a handful of us rarely tire of reading. :-) Many of you occasionally don't feel like reading or at least don't get into a certain book. Then you do something else (computer games, crafts or TV are some choices) or read something else and try the non-engaging book again. As to purses I guess I shouldn't be surprised that none of us have a major purse fetish. I guess one fetish -- books -- is enough! We had one person with 0 purses and one with 25 although she only uses one. Many mentioned 3-6 purses but still most of us had one that we use for daily. The Winner from SBB #110 comments is: #11 Carol L who can make a GC choice if international or book choice from the ARC/Review titles, Christmas titles or Love titles - all linked near the end of the post. Please let me know your choice by completing the (new) WINNER FORM. Q1. Miki asks: Have you ever met another bookblogger in person? Would you want to?? A: I have met a couple of authors that I met online but I have not yet met another bookblogger. 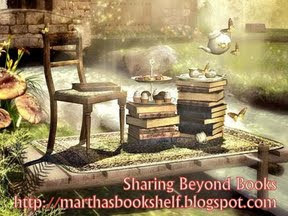 I would love to meet other bookblog friends in person. Maybe next year I will go to the Bookblogger conference. Q2. My non-bookish Question this week: Some of you anticipated this with your answers last week -- Are your purses backpacks or minimalist?? A: As I mentioned last week I use a sort of side bag to carry daily. It contains Kindle, MP3, card case with ID and one or two credit cards, pen, tissues, small sticky notes, smartphone, eye drops, sometimes a non-aspirin and some money. If I switch to a 'real purse' it will have a couple of tissues, a pen and an emory board. I just move over the phone, ID case and MP3. If I am traveling I do use a backpack and add a few items, including a paperback. You can tell what is important to me! I wanted to include my own photo but I couldn't get my card to read tonight. This is similar to my bag. Image found at Married with Luggage. I will pick a Comment winner from all comments made by Friday, August 2, 2013 at 10 PM central. I carry a good size purse daily but if I am going to a convention I do one like yours. id, cc money, kindle or book usually kindle and paper to get authors autographs plus phone and camera. I have met some bloggers but can't think of their blog offhand. Since I've talked to them more on the boards that blogs. 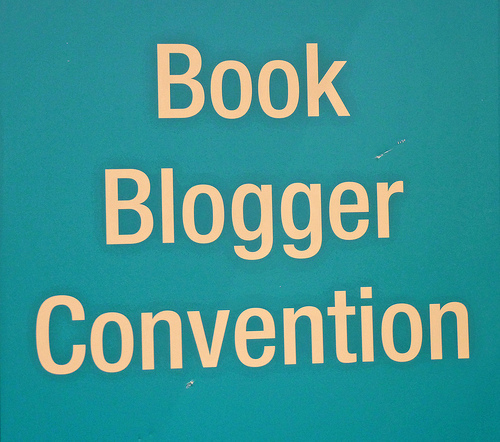 I met a bunch of bloggers at BEA 2012 and had a blast. I also attended the 2012 Ontario bloggers meet-up, and got together with a local book blogger occasionally. I haven't met anyone since I moved from ON to BC though. I'm looking forward to finding some local bloggers though. 1. I came really close to meeting a blooger in person. She was desparate to catch up on doing book reviews and contacted me because she liked my contacts. We have been e-mail friends for three years throgh surgeries,good times and bad. She moved closer so that she could be near her grandson. We had planned on getting together. But had to sell our house and we are now farther away. Still hoping that we can get together in person. 2. I have just one sling bag which is similiar to a backpack. I also have some purses and eyeglass holders that I knitted. I love inventing new patterns with color. I made the cases for all my friends. It was so addictive! 1) I've only met one book blogger when she visited Sri Lanka. That was Sakura of Chasing Bawa. 2) I think what you call a purse I would call a handbag! Mine are big which takes a lot of stuff. I've never carried a backpack in my life. Does that make me unusual? Q1: I have not yet met another bookblogger in person, but would love to. Q2: I use a backpack since I usually am taking at least two books and some magazines with me. I like to be prepared for anything that might give me time to read. I also carry a small notebook and pens with me, plus something for a headache in case I get one. 1. I have never meet another book blogger in person. 2. The purse I use over the summer is a mini backpack (a more modern version of the ones popular in the 90s). The rest range from clutches to almost totes. 1: I have not, but I would like to. to discuss ideas and experiences. 1. I've yet to meet another book blogger. 2. I quit carrying a purse when I had surgery last year and found it quite liberating. I haven't started again yet but it's still sitting there waiting. When I go to the zoo I carry a backpack but otherwise , it's a purse. 1) My sister blogs, so I guess I can say I have, but I would like to meet other bloggers in real life. 1. I've never met another book blogger in person, but it would be fun to meet and talk. 2. My handbags are quite large. I need to carry an umbrella, a water bottle & a book at all times. 1. No I haven't met one. 2. I carry a purse, never a backpack. I use a large purse but never carry a backpack. Q1. Have you ever met another bookblogger in person? Would you want to?? I haven't, but I would love to. I had no idea that there was a book blogger convention! I must find out more about this!! Q2. My non-bookish Question this week: Some of you anticipated this with your answers last week -- Are your purses backpacks or minimalist?? I tend to carry a larger purse even though I don't want to. But I always need to have my Kindle, charger, iPhone, charger, magazines, wallet, etc. That with all of my kids' stuff and I end up carrying way too much! Though I am trying to minimize lol. 1. I have not met a book blogger (or author) in person yet but I would like to. 2. My purse is in between. Not to big and but not real small. It is enough to hold my wallet, keys, phone, lotion, a a few other things. No, I've never met one. I'm not a blogger myself & I'm quite in awe of anyone who does blog. The handbag I use most frequently is a nice size but not too large. Fits a book, my wallet & phone. Even I need something larger (for travel etc) I carry a conventional backpack.